My name is Amelia Smith and I am currently a senior and the Humane Society Head at The Hotchkiss School in Lakeville, Connecticut. During the summer of 2015, after I finished my freshman year at Hotchkiss, I traveled to Chiang Mai, Thailand for a veterinary service trip. On this trip I spent a week at the Elephant Nature Park learning about the sanctuary and caring for the elephants. Throughout this time I learned not only what a special, peaceful place this is, but also what great importance the sanctuary has in the lives of so many elephants. ENP has been a safe haven for Asian elephants since the late 1990s. Now providing safety and care for over sixty elephants, ENP strives to educate visitors about the thriving entertainment and trekking industries fueled by tourists’ money and support. Lek, the founder of ENP, teaches visitors about the process of “breaking an elephant” in order for it to be ridden and controlled for trekking and logging purposes. Whether the elephants are born in captivity or poached in Burma and brought to Thailand to be trained, each individual goes through a process called phajaan, which translates into English as “the crush”. This process consists of ripping a young elephant from its mother and torturing it into submission by chaining it for days on end, starving it, and beating it with bullhooks until its spirit is effectively broken. Elephants are incredibly sensitive, intelligent beings with unique personalities and characteristics just like us. They have gentle souls and intricate means of communication. 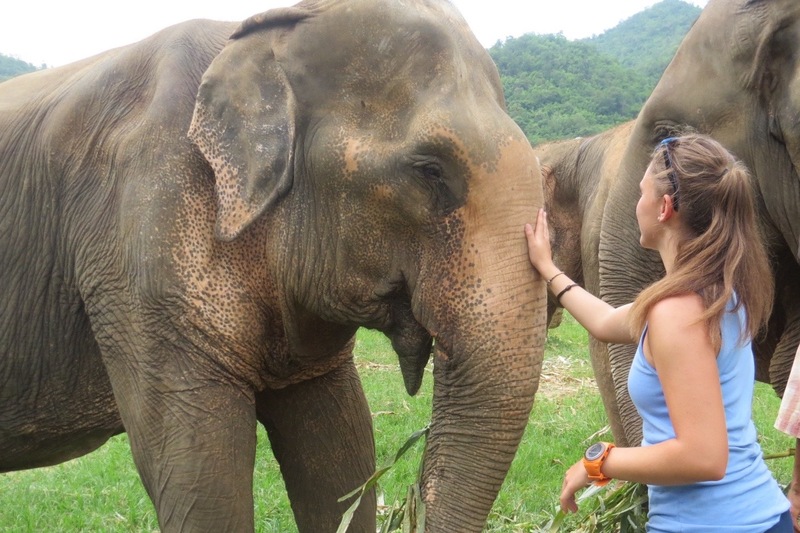 After spending a week at ENP caring for the elephants’ wounds, feeding them, bathing them, and conducting diet studies for the veterinarians on site, I was able to fully grasp the extent of their amazing qualities. One of my favorite interactions was when one of the elephants, Mae Boonma teased her best friend, a blind elephant named Mai Buo Loi, by moving fruit out of her grasp and waiting for her to find it with her trunk. Boonma passed away last June and Buo Loi grieved for many days, visiting her body frequently after her death. Relationships like these are common among elephants, which makes it all the more heartbreaking to know that these creatures endure such awful treatment. Although Lek’s work has faced much controversy in Thailand, her commitment has caused her to make great strides for the lives of Asian elephants. She provides a positive example for surrounding parks by employing mahouts who were formerly part of logging and trekking industries and giving them a chance to see the value in an elephant’s freedom. Lek has noticed a remarkable following in the recent past from other parks that have decided to take up the framework of a sanctuary rather than a trekking program because they see that she is attracting just as many, if not more tourists, through her cruelty-free and riding-free sanctuary. The Hotchkiss Humane Society has just begun a school-wide fundraiser to support Lek and the elephants at the Elephant Nature Park, but we would like to extend this to our broader community to raise awareness for Lek's incredible work and to increase the amount of financial support we can give to her. I met Lek in 2015 during my service trip, and through the generosity of my community, I was able to purchase a substantial amount veterinary supplies in Thailand to deliver to her office in Chiang Mai. I hope that the Hotchkiss Humane Society can be even more impactful in this fundraiser. We would greatly appreciate any contribution you can make. Each donation goes a long way.